For monitoring of temperature sensitive shipments along the entire cold chain,tempmate.®-S1 V2 single-use temperature data loggers are the most intuitive and cost-effective solution on the market. tempmate.®-S1 V2 data loggers are equipped with an integrated USB port and PDF generator on board, so they do not require any additional software or hardware to start temperature recording or reading the data from the logger: These single-use loggers are supplied pre-configured according customer's settings and automatically generate a comprehensive PDF report after being connected to a computer. With its compact size tempmate.®-S1 V2 data loggers will fit in every packaging, saving space and weight. The generated PDF report contains comprehensive information about the monitored conditions: Complete data graph, statistical information like MIN, MAX, AVG, MKT, cumulated time outside thresholds and every single measurement in a table. Please click here for tempmate. PDF sample report. Curious about your Cold Chain? tempmate.®-S1 V2 continuously monitors all relevant data. 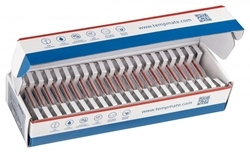 tempmate.®-S1 V2 loggers are specially designed for temperature monitoring in any cold chain logistics. As a pre-programmed device tempmate.®-S1 V2 can be instantly used to monitor your temperature sensitive consignment. The automatically created PDF and CSV report, containing detailed information such as data curve, every single measurement as a table and statistical information. The optional tempbase.® software for data management and reprogramming can be downloaded for free. tempmate.® references – Companies using our single-use temperature data loggers. Are tempmate.®-S1 V2 loggers IATA compatible, meaning they can be used in aeroplanes? Yes, to the latest IATA Guidelines, our tempmate.®-S1 V2 Single-Use data loggers does not need to be declared. From leaving the factory, each logger has a life of at least 1 year, maximum 24 months. The respective best before date is printed on the reverse of the logger and should always be kept in consideration. Are the tempmate.®-S1 V2 loggers calibrated? Is it possible to analyse tempmate.®-S1 V2loggers with software and to export the data? The tempmate.®-S1 V2 is optionally compatible with the tempbase.®-D V2 software. This software can manage all the measurement data and export it as a PDF or CSV file. The tempbase.®-D V2 software is available as a free download, either here or in the software download box to the right. Just as is the case with any other electronic document, it is possible to manipulate PDF files. However, even after the data has been analysed, the original data remains stored on the logger, so that it can always be downloaded again and compared to the questionable PDF report. Therefore, it is important that the loggers are saved until any such queries have been completely clarified. The tempmate.®-S1 V2 data loggers have an integrated real-time clock (RTC). This is set to GMT±0 before leaving the factory, and is therefore used for the tempmate.®-S1 V2’s PDF analysis. The starting time is therefore documented with to-the-second accuracy, and the stop time always corresponds to the last measurement interval when it was stopped. tempbase.®-D V2 Data Management Software. tempbase.®-D V2 data management software for tempmate.®-M1 andtempmate.®-S1 V2 can program the logger, upload every recorded data to computer, systematically analyze or collect and manage the data.